Just two council by-elections this week, both easily held by Labour. There was a swing here of 1.2% from Tory to Labour. That sounds quite small, but the figure is the movement since May’s local elections, when Labour did particularly well in London. For a better reflection of how much the capital has swung away from the Tories during the course of the coalition government, we can compare Thursday’s result in Lambeth with the one from 2010. This gives us a swing from Tory to Labour of 7.7%. 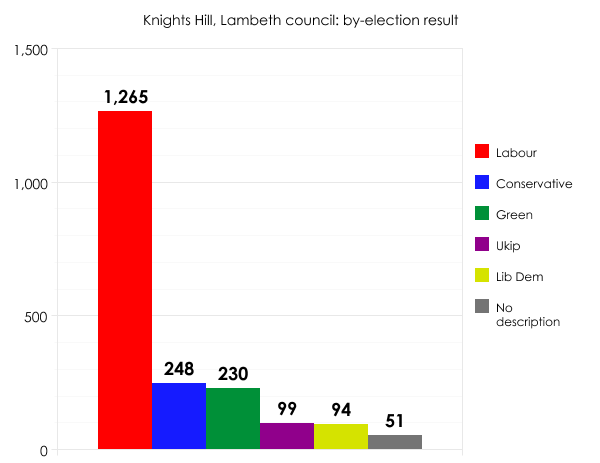 Lambeth is now a Labour fortress. The party holds 59 of the council’s 63 seats, with the other four being shared by the Tories (three) and the Greens (one). Before May’s local elections, the Lib Dems boasted 15 seats in Lambeth. After May’s local elections they had none. Judging by this week’s result, the malady lingers on. Note also that Ukip continues to do very poorly in London, again mirroring the trends in May. Here the turnout was a pathetic 12.5%. When this seat was up for grabs in 2011, Labour’s vote was 647. This time the party mustered less than half that amount. Being charitable to the voters of both Bolsover and Lambeth, it is the height of the holiday season. Even so, victory in a poll where only one in eight electors bothered to take part is hardly a compelling endorsement. 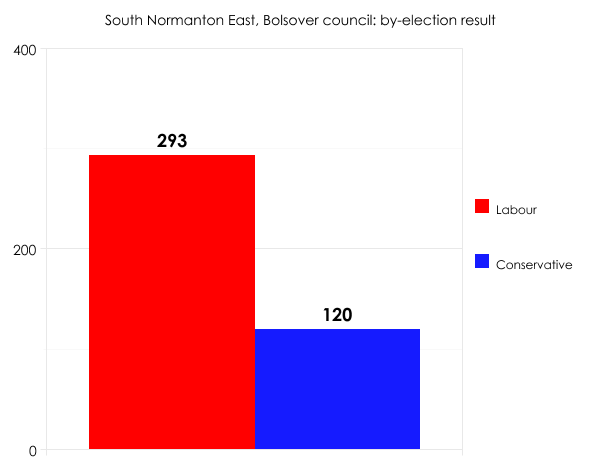 Like Lambeth, Bolsover is rock solid Labour. The party holds 32 of its 37 seats, with another three belonging to a residents’ group and the other two being represented by independents. No Tories, Lib Dems, Ukip, Greens, BNP or anyone else. Next week we have possibly the largest single by-election in British political history. But to continue this week’s theme, it could quite possibly see one of the lowest ever turnouts.